So right now, I’m dog-sitting a neighbor’s cutie pie poodle mix while they’re out of town. Just so you know, they live in a Better Homes and Gardens house. It has accent vases, a suspicious yet pleasant lack of dust, and a perpetual sugar-cookie smell. Since I’m hanging out with his pooch, sometimes I have pretend day-dreams that it is my house and I handpicked all of the artwork from small dealers and bought my hand-painted plates from a lavish vacation in Italy. Plus, it’s hard not to want to imagine living in a place where dog hair, dust and weird fart smells are virtually non-existent… especially when I walk in my door and am greeted by not only my two real-life dogs, but the small cluster of miniature fur bunnies that have collected from their stray hairs. Or the trail of ants now currently residing in my pantry. Or all those pantry contents spread out on my kitchen table, rendering it virtually useless and cluttered and messy and gross and OH MY GOD WHY CAN’T MY HOUSE SMELL LIKE SUGAR COOKIES?! Do you ever notice other people’s house smells? So weird. My best friend’s house always smells like warm vanilla. And Jessie’s house smells like food has been cooking away all day, even though his room smells like boy. But I walk into my house and smell… nothing. I desperately spritz Febreeze and light candles and even bought those fancy wall smelly plug-ins but no matter what, it still smells like… nothing. Maybe I’m not meant to live a life of clean houses and luxuriously sweet smells. Maybe I’m bound for a life of sordid things, like living with 57 cats and year-old nachos bell grande strewn about the place. I’m not meant for a home that constantly smells like baked goods or perfectly polished wood furnishings. I guess I became a little depressed at this revelation and made some Inside-Out Oreo Peanut Butter Cups because if I can’t have exotic home furnishings and fur-free floors, at least I can have some highly addictive, super awesome candies. I’ll just throw them in a fancy bowl and consider myself living luxuriously. 1. Line two muffin tins with 24 paper liners and set them aside. Meanwhile, in a large bowl, microwave the chocolate according to package directions, stirring until melted and smooth. 2. 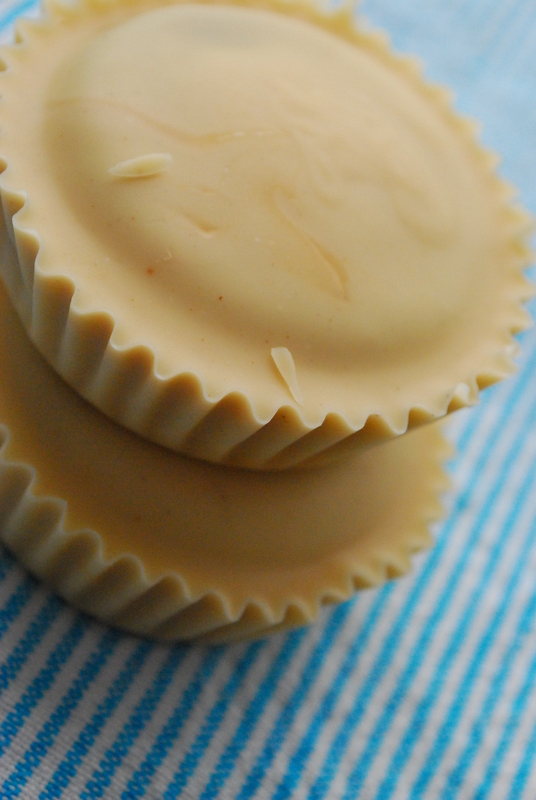 Stir the peanut butter into the white chocolate mixture to combine. Pour about 1 Tablespoon of the peanut butter mixture into the bottom and lightly up along the sides of each paper liner. 3. 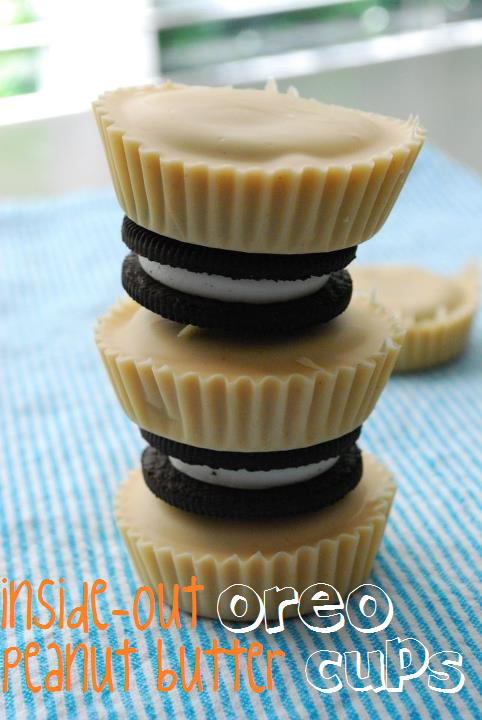 Place an Oreo cookie snugly on the bottom of each lined cup. 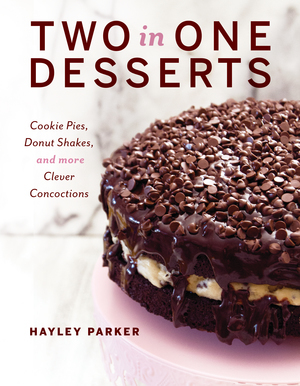 Top the cookie with another Tablespoon of PB mixture, covering the entire cookie and allowing the excess PB mixture to drip over the sides of the cookie to “seal” the cup. 4. Place the cups in the freezer for about 30 minutes to harden, then bring them to room temperature before eating. Store any leftovers airtight for up to 3 days on the counter, or about a week in the freezer. 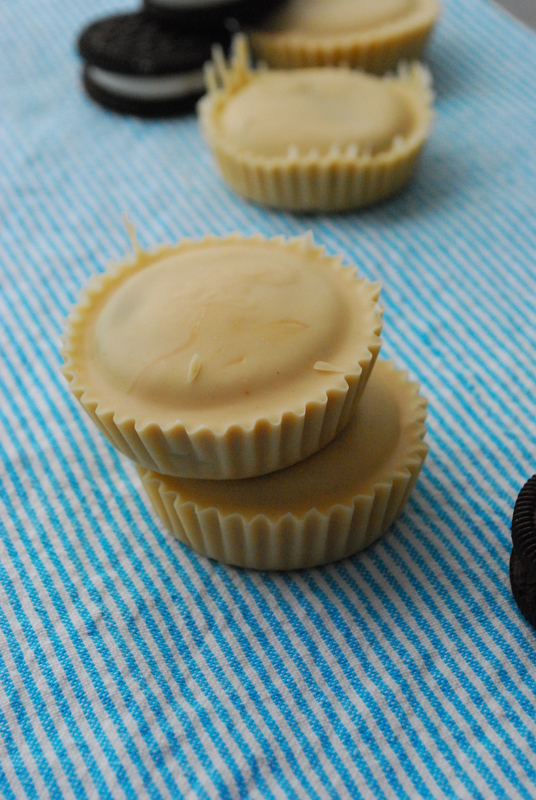 The Oreo cookie inside is a fun twist on the classic peanut butter cup, and the balance of chocolate and peanut butter is perfect… they should make Reese’s like this all the time! This is seriously and incredibly awesome!!! Forget breakfast…I want 12 of these like now!!! Me too.. but we ran out! 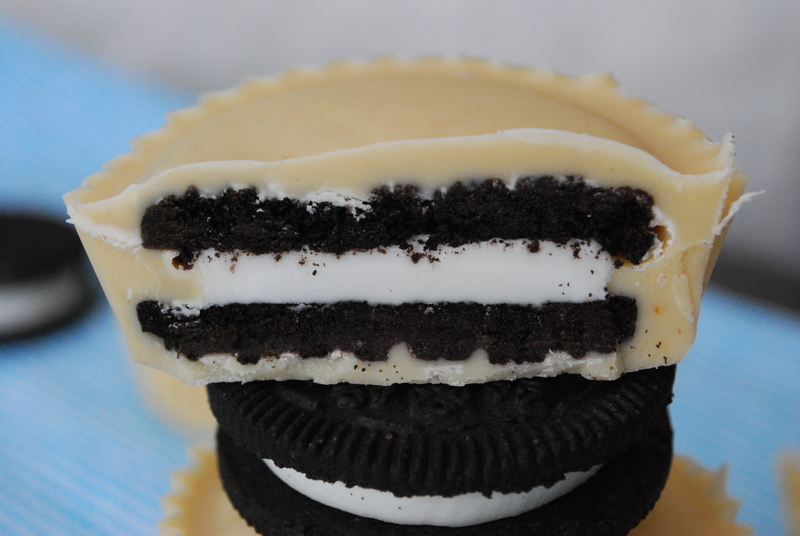 Must make more… with maybe different Oreo flavors, too! I love dog sitting because I get a doggie fix without having to clean up after it constantly. I watched my brother and his fiance’s poodle a couple weeks ago. So cute! Enjoy the little poodle! Also…let me know if you figure out the house smelling secret. I will keep you posted–but so far, I think it’s just magic or something. It pretty much smells perfect still–four days later. 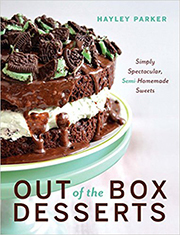 I think that’s why I bake so much when company is over. So that they will be wowed by my kitchen skills and not unimpressed with my cleaning ones. 🙂 These are pure genius, btw. 🙂 Pinned! Don’t know how I could have missed these. Mr. Picky-eater will love them! Oreos are his favorite cookie – doublestuff only – and peanut butter? YUM! Hi there! 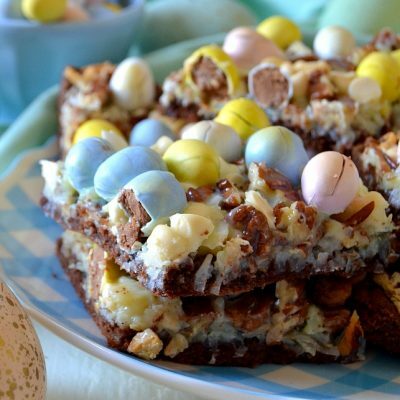 What is White Chocolate bark? I haven’t seen it in the stores – is white chocolate chips fine to use? Hi Natalie! White Chocolate Bark is a chocolate candy coating that’s pretty easy to find if you’re in the USA. I love it by the brand Candiquik, but any almond bark or candy coating bark should work just fine 🙂 I like chocolate/almond bark because it has a higher melting point which makes it less prone to seizing; it also coats much smoother than regular chocolate. However, if you can’t find candy coating you can always use white chocolate chips; just melt them low and slow (or if in the microwave, stirring after about 30 seconds) to prevent scorching. Any advice for getting the smooth texture of the peanutbutter/bark mixture. Normally with pouring chocolate, even bark, it comes out blobby. How do you get yours to look so professional!